Irene has come and gone from Vermont, but we are going to be dealing with her effects for a long time. Homes and businesses are destroyed, roads and bridges washed out, and people displaced and understandably concerned. Irene was an 'almost-worst-case-scenario' for Vermont, and hopefully we won't see anything like it again in our lifetimes. However, floods are a part of Vermont life and we will certainly face other damaging floods in the years to come. While we can't completely stop them, there are things we can do to decrease their intensity and increase our preparedness when they do occur. 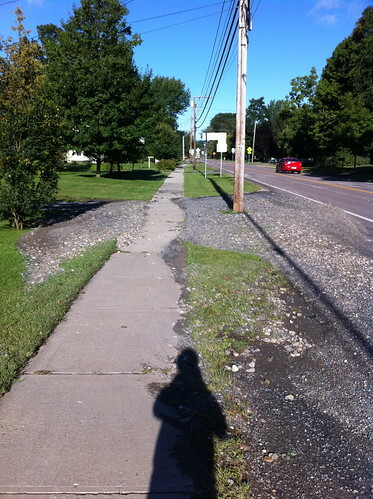 In some ways, reducing flooding in Vermont is harder than in many areas. Unlike Pittsburgh, with highly urbanized, modified watersheds, or California, with its channelized streams and massive habitat loss, Vermont is a mainly rural state with vast, healthy forests and small towns. Still, there is much we can do to reduce risk and impact of floods. This post includes some ideas I have about how to reduce flooding risk, prepare for floods, and better cope when they do occur. If you think these ideas make sense, please share this with others. If you think they don't make sense, leave a comment and tell me why. The most important thing right now, aside from cleanup and repairs, is looking ahead together as a state to make sure nothing like this happens again. After learning that East Middlebury largely escaped serious damage from the Irene floods, i set out to check on what had happened along the river. Like most areas of Vermont, the water rose higher than any of the residents I talked to remembered (I'm not sure how this area fared in the floods of the late 1920s). It seems that this was at least a '50 year flood' if not a '100 year flood'. (Note that these floods are named by their probability of occurrence, ie: a 100 year flood has a 1 in 100 year chance of happening. They don't necessarily happen every 100 years). 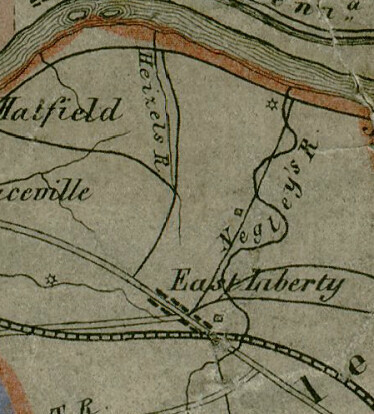 East Middlebury lies on a glacial delta that formed when glacial Lake Vermont filled the Champlain Valley. 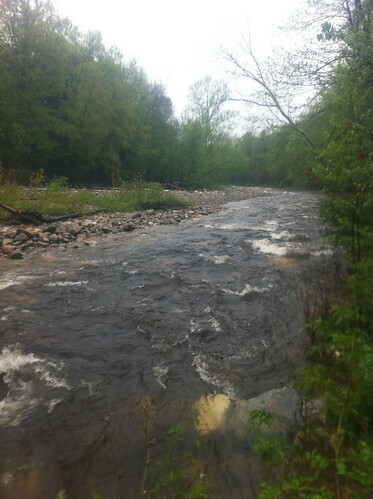 The river emerges from the mountains and changes from a steep, gorge-confined river, to a meandering, slow stream as it passes through East Middlebury. In the process, it drops sediment from the mountains. 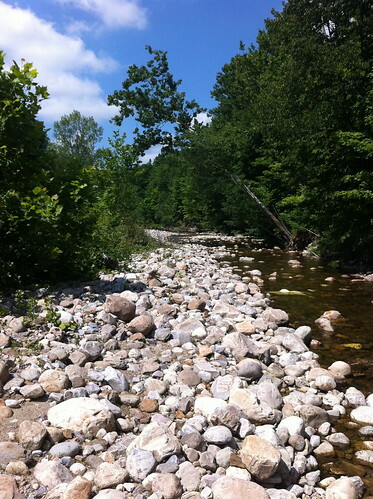 Larger rocks are dropped near the gorge, gravel and sand carried further, silt deposited in slow-water areas, and clay carried out of the area (and often all the way to Lake Champlain). 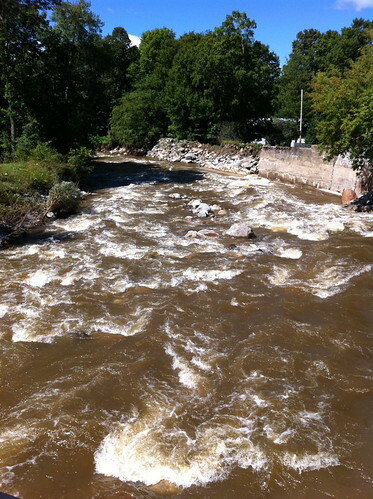 Anyway, back to Irene... the storm created a historic flood that had big effects on the river. But, in the rockbound gorge, very little changed. The gorge was at least in part cut when the river was much larger than now due to glacial dams diverting the New Haven River down its course as well. So, even this major flood is smaller than the floods that carved the gorge. 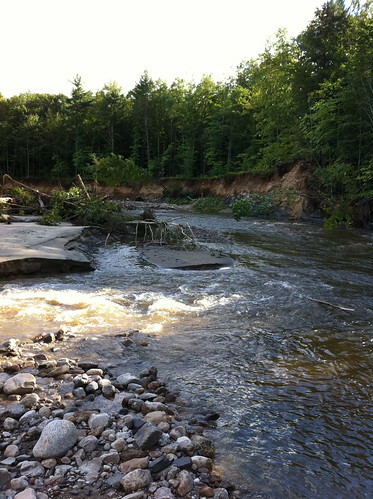 While some rocks shifted, the river's course did not. It takes thousands of floods like this to carve a gorge like that, and it doesn't usually change very fast. See the comments on this post for more info on the glacial history of the area courtesy of Chris. The river was RAGING the day after the Irene floods. I very carefully took this picture, making sure to avoid the banks of the river, which could have been eroded by the floods. If I fell into this, I'd be done for! After leaving the gorge, the river slows down a bit and passes through town. Here's the river from Grist Mill Road, looking downstream. As the name implies, there was once a mill here. You can see the features in place to protect the town from the river. They have worked well for many years, but this flood was too much for them. Upstream from here, the river jumped its banks and ran down Highway 125 for a while, flooding basements and eroding driveways. Note that the river is still rather confined by its banks and these levees. Between Grist Mill Road and Route 7, the Middlebury River drops a lot of sediment. Its course begins to wander, and sycamores and cottonwoods, rare in Vermont, line its banks. This part of the river is very dynamic, and changed a LOT during the floods. Both these areas are almost unrecognizable since the river has changed so much. Trees from upstream are laying in piles everywhere. This looks like a lot of destruction, but trees in rivers provide habitats for lots of creatures, including trout and the species they eat. Above, a side channel of the river erodes backwards towards the main stream. Eventually this channel may reach the main channel and 'steal' its water, causing the river to shift course. In this case, this happening would not endanger structures since it's in the undeveloped flood plain. The old river channel would become a wetland, then gradually fill in with cottonwood and sycamore trees. Over the thousands of years since the last Ice Age, this process has created a dynamic, diverse ecosystem along the river. 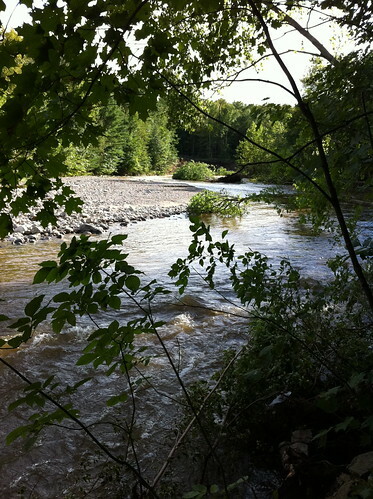 The Middlebury Area Land Trust has obtained a conservation easement along part of the river in this section, which will allow the river to continue unrestrainted in its wanders. Downstream from Highway 7, the Middlebury River has dropped most of its heavy sediment, and it slows down and meanders extensively. I didn't visit this section yesterday, because it was more heavily impacted by flooding and I didn't want to get in the way of residents dealing with flood damage. I'll visit the lower section of the river at a later date and see how it fared during the floods. Note: please respect private property rights and don't try to access the river through private property. There are places where you can see the river near the 125 and 7 bridges. The MALT parcel is not yet developed for public access, but may be in the future. 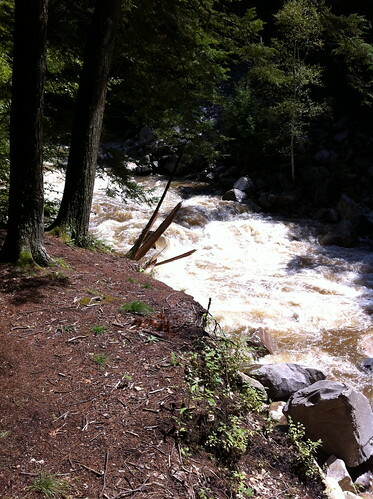 This river is very sensitive to rainfall and rises fast during floods, so stay away from the river, especially in the gorge, during and after heavy rains! 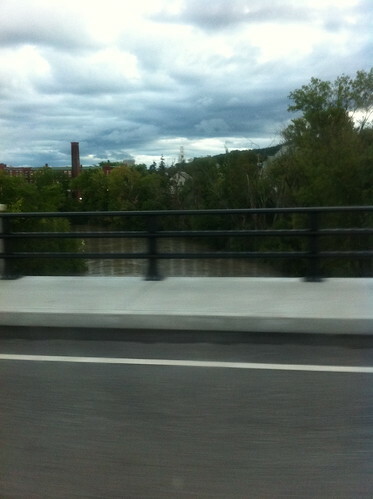 Otter Creek leaving Middlebury... high but not dangerous. The crest hasn't arrived here yet, though. The sky looks nasty, but the clouds were clearing. Hard to see above, but there is a high water line near the sidewalk. 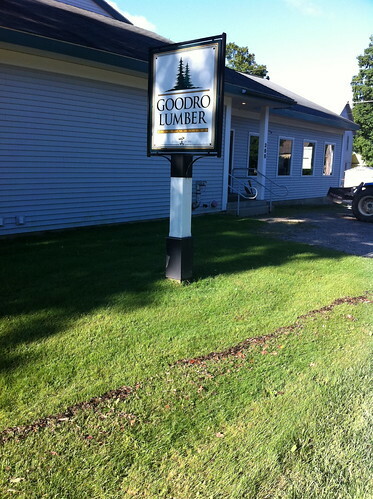 Goodrow Lumber was spared, except for some very minor parking area damage. Mac's Market across the street was also spared and was open. They told me they had to open a bit late, but everything was fine. Nearby, many people were pumping out their basements. Our home was undamaged, as it is a couple of feet above the road. Our garden was not damaged by flooding, but was damaged by the groundhog again. I was hoping it had drowned, but apparently not. The river is raging, and is almost unrecognizable. 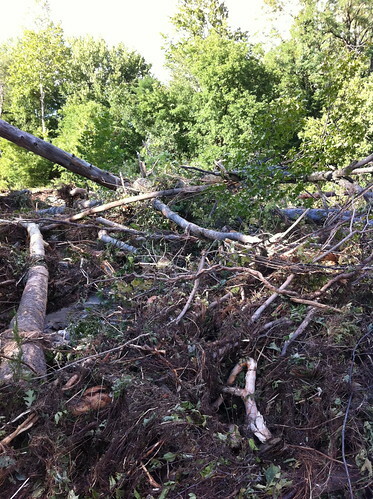 Trees had been uprooted and existing logs have washed away. A 20' tall, 50' long section of vertical bank was created. Note that the young trees to the left were almost completely destroyed (there is a reason they were young... they are on a gravel bar. That area floods often). The leaning sycamore to the right somehow survived the flood. 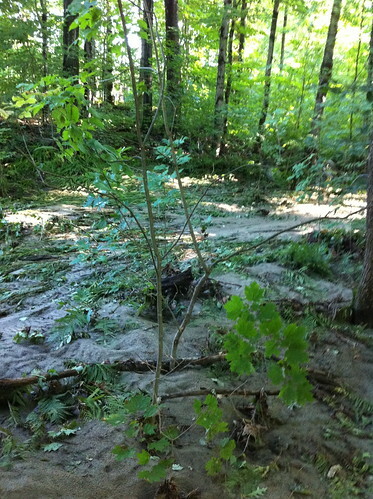 The flood plain along the river had been buried in mud and debris. Unlike human structures, floodplain forest is well adapted to frequent floods. This deposit of silt and sand will provide nutrients for the plants, and will benefit the flood-adapted plants in this area such as sycamore, cottonwood, and ostrich fern. Later today I will check out the gorge and the bridges, and find where the river jumped its banks and flowed down the road. Unfortunately, homes in that area probably sustained more damage. Also, if you want to see me as a soggy flood refugee, I was interviewed in Channel 3 news yesterday evening. our house was not damaged in the flood. 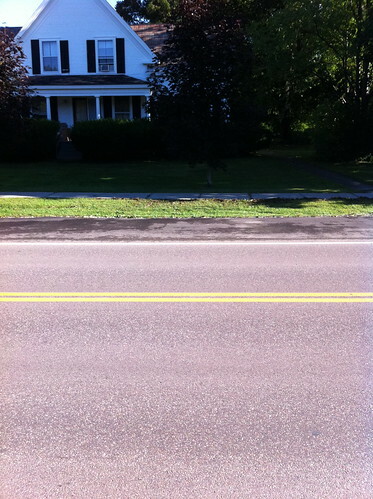 It's possible to see where water ran down the road but we are up high enough above it to have avoided damage. Many others in East Middlebury and elsewhere in Vermont are not as lucky. 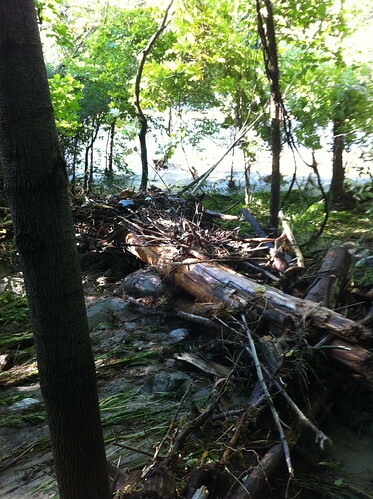 Vermont has been devastated by Irene's flooding. It ended up even worse than I thought it was. We were evacuated from our home at 4:30 pm today. Soon after we left the river started flowing down the main street of our village. We are safe as are our friends and loved ones. We are staying with friends now. Hopefully we can go home tomorrow and hopefully our home is ok. We don't think the floodwaters got inside... But we don't know. It seems that the river jumped into an old channel that main street was built on. There will be plenty more to post about this tomorrow, but as I am on my phone I can't say much more. 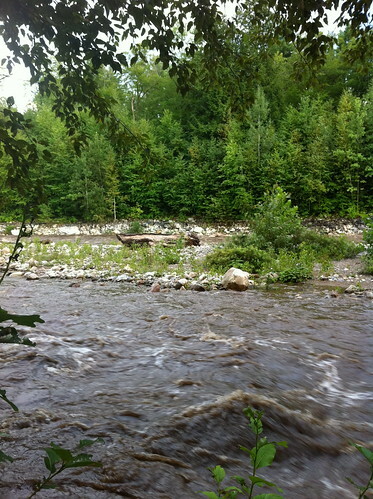 I will say this flood will change our relationships with our Vermont rivers as dramatically as the floods in the 1920s... And hopefully in different ways. And hopefully our decisions back then don't end up making the flooding in Montpelier even worse than otherwise. Sleep well, Vermont... Tomorrow is a day to start diging out. So, that particular map seems to indicate that there could be 7 inches of rain in most of the Vermont side of the Champlain Valley, and at least as much in the southern Green Mountains. Most of that would be Sunday afternoon through Monday morning. The NWS is calling for 3 to 5 inches of rain in the Champlain Valley and up to 7 inches in the mountains. This is less than the scenario above, but still enough to cause flooding. My guess is we will see some roads washed out and flooding in some areas near rivers. One important thing to note about that map, though, is just how narrow that predicted area of heavy rain is. There's a good chance any one spot will miss out. I don't want to wish that 7 inches of rain on New Hampshire or the Adirondacks, but I really hope it doesn't hit Vermont. I love big storms... but this is excessive. At this point it appears that the 'best case' scenario of the storm being pushed out to see is very, very unlikely. I don't want to cause people to panic, and as long as you live on high ground, you will be quite safe. Just stay away from the rivers for a while, and most importantly, DO NOT DRIVE INTO FLOODWATERS. Sometimes it looks like the water flowing over a bridge is just a few inches deep... but in reality, the bridge is 100 yards downstream rather than still attached to the road. There's a lot of info on Hurricane Irene already out there but I thought a quick update on its effects on Vermont was appropriate. There was a great update by Matt Suskoski on the Weather Rapport blog. This blog, at blogs.burlingtonfreepress.com/weather/, is a good place to get updates, as is the official NWS site at http://www.erh.noaa.gov/btv/ . The storm has shifted west and slowed down a bit. This is a bit of good news for me personally, because I'm planning a trip to Western Massachusetts on Friday and it looks like by leaving early Sunday morning we'll avoid most of the storm. The bad news is it will follow us back to Vermont. And, since it is moving slower than expected, it may also stay in Vermont longer than expected. 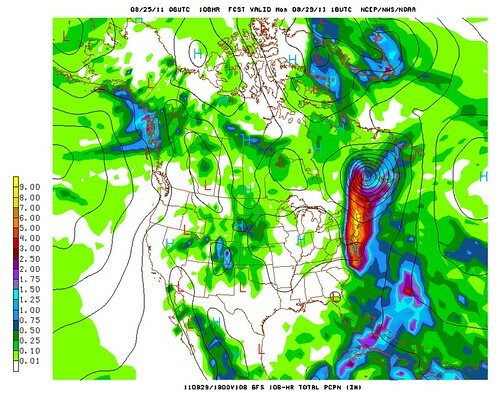 Right now, some computer models predict that the Irene will pass over Vermont still at tropical storm strength... and very wet. Most areas of Vermont would get at least 5 inches of rain if this model were correct! Of course, hurricanes are very hard to forecast, and it could still miss the state entirely. It's worth noting though that Otter Creek in Middlebury was noticeably higher than its normal summer level today, and that heavy rain may happen today with thunderstorms not associated with the hurricane... so the worst case scenario is a pretty nasty one that could leave us with significantly worse flooding than this year's nasty spring thaw or May thunderstorms. 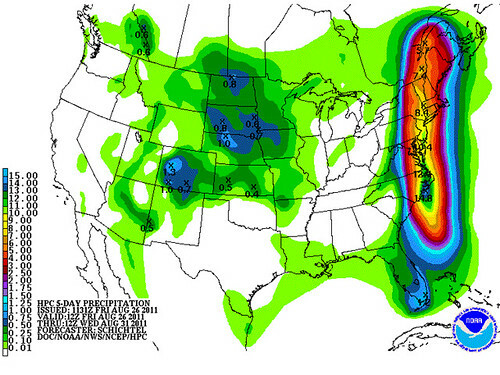 Above: A model prediction of 4 to 8 inches of rain in Vermont from Irene. These models sometimes miss the local effects of mountains so it's not impossible that areas of the Green Mountains would get over 10 inches of rain if this model were correct. Yikes! We're far from the river and in a very solid old building so I doubt we'll have flooding in our home, but there's a good chance that many bridges will be washed out, roads will be covered in mud, power will be out, and no one will be going anywhere for a few days. Luckily we've got a lot of food stored here. You should too. Make sure you have plenty of food, water, batteries, and other emergency supplies available, because you may need them! I'll try to post updates but for emergency info, you are better off checking the National Weather Service site above and listening to your local authorities. If you are in an area that flooded already this year (except lake flooding) or has flooded in the past you may consider staying at a friend's house Sunday night. Update Thursday afternoon: Still definitely looks like Irene could have a big impact on Vermont. One recent computer model I looked held the brunt of the storm back until late Sunday night or Monday morning. There's also the chance it will miss us completely. We'll see! 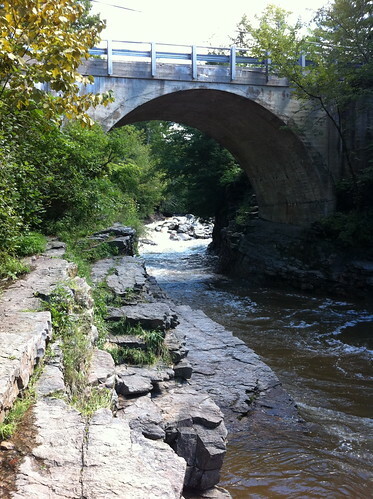 After writing earlier this week about Negley Run's flash flood on Washington Street in Pittsburgh, I became curious about the historic watershed. Since I hadn't heard anything about it before, I figured it would be a small one, so I started mapping the historic channels, based on topography and this map from the Darlington Digital Collection. Turns out it is a huge watershed - comparable to the Junction Hollow watershed in many ways. 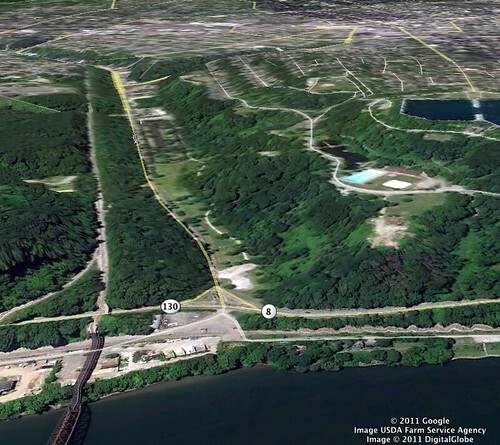 In fact, it once included a lake called Silver Lake that appears to have been similar to Panther Hollow Lake. 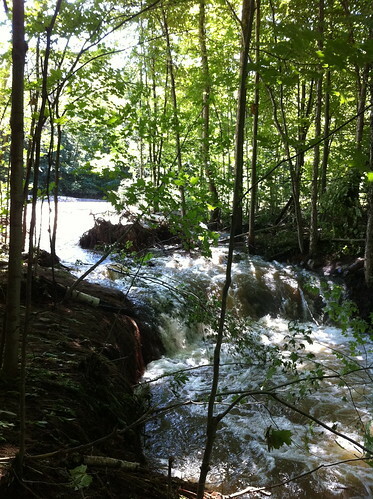 Unlike Junction Hollow, however, this watershed does not have any intact streams present except very small ones in Highland Park and perhaps in other very steep areas. Negley Run is the northern of these two watersheds, and Junction Hollow the southern. Note that the colors mean different things for each map (oops). For Negley Run, the dark blue lines are creeks that appeared on historic maps while the light blue lines are areas that probably had flow based on topography. The yellow/orange channels around Penn Hills appear to have drained into Negley Run but the water that falls in that area is now routed into the Nine Mile Run 'sewershed'. So, in a way, Negley Run is even 'beheaded' like Panther Hollow run is, although there is no aboveground stream to offer evidence of this. Notice just how much area of dense urbanization drains down towards Washington Avenue. Imagine two inches of rain in an hour, over that whole area, being forced into old sewage pipes that were possibly build before all that development was in place. All of that sewage water was pouring towards the river, but the system got overwhelmed, or clogged, with horrible tragic results. Negley Run doesn't have a visible creek, and to my knowledge doesn't have a watershed advocacy organization. It's still important to the people of Pittsburgh though, if for no other reason than the fact that in its current state it is dangerous. For that reason, the watershed health of Negley Run is every bit as important as that of Junction Hollow and Nine Mile runs. On a side note, Junction Hollow was impacted by this flood as well. 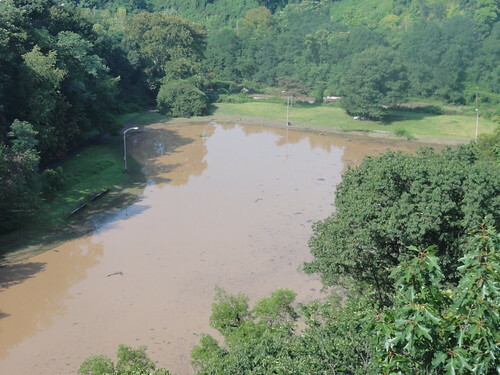 Check out these pictures, taken by Martha Riecks, of Panther Hollow Lake after the deluge. Lately I've been working on a little side project, which involves figuring out how to make computer games with the game software GameMaker. The game I've come up with (which is in its early stages!) 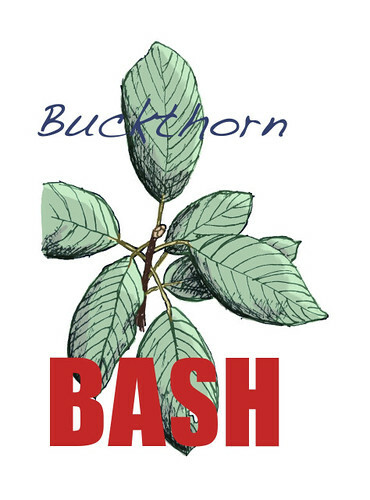 is called Buckthorn Bash. Pittsburgh was faced with a tragedy last week when extreme downpours caused a flash flood that killed four people. A torrential thunderstorm dumped two inches of rain in an hour, on top of already saturated ground. This caused a massive sewage-stormwater overflow that suddenly swamped Washington Boulevard, leading to the tragedy that claimed these four lives, including two small children. I found this article about lessons learned from the flood. The point that life is precious and tenuous is a well-made point. But why not look beyond that? Why not look at the causes of this disaster and try to keep it from happening again? Warning systems and closures are on the right track, but may not be enough. It's in a hollow, just like Panther Hollow, Junction Hollow, and the many other hollows of Pittsburgh. It's been a hollow since before the city was built. And, under the earth and concrete, in a sewer line, is the buried, modified path of what was once called Negley's Run. When a waterway is put underground, it is out of sight and often out of mind, but it doesn't stop being a waterway. 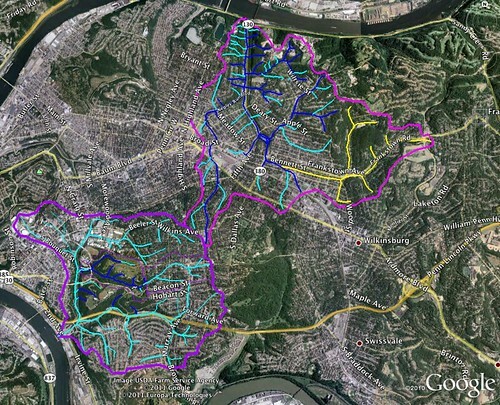 Negley's run has a rather large watershed, one that still captures massive amounts of water during summer downpours. In fact, runoff is faster now than it was before the city was built. Impervious substrates rush water into the drains, where it is funneled through pipes. Furthermore, without being able to easily see what is happening in the pipes, it is difficult to know if there are blockages in the flow, or to see water quickly rising. 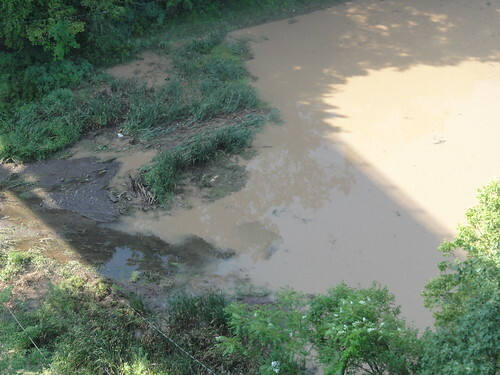 Sewage-stormwater overflows happen often in Pittsburgh, but usually 'only' dump sewage into the rivers. During my project I did learn that overflows like this one do sometimes happen in the Junction Hollow neighborhood, where they fill the basements of unfortunate residents with sewer water. Overflows happen into Nine Mile Run at Frick Park as well. I don't know if rain gardens, impervious substrates, additional trees, rain barrels, and daylighted streams could have stopped this flood. 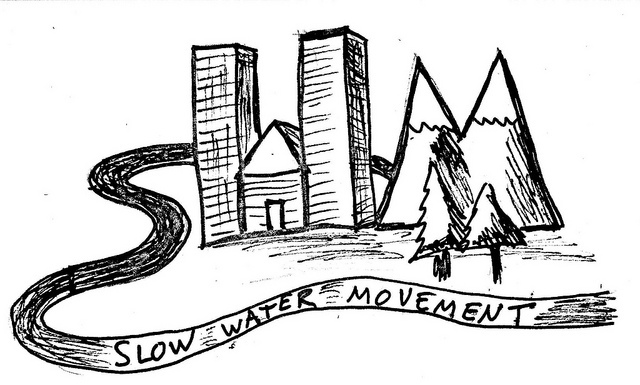 I do know that these measures have been proven to SLOW the movement of floodwaters (after all, that is what inspired the title of this blog). Water rose FAST during this flood - acting more like a flash flood in the Desert Southwest than a flood typical of Pennsylvania. If we could have slowed this flood down just a few minutes, it might have been enough to prevent these tragic deaths. Watershed health isn't 'just' an environmental issue. Floods kill people each year, and ruin the homes and businesses of many more. As weather appears to be becoming more extreme, perhaps due to climate change, and as we degrade watersheds more and more, tragedies like this are going to become more and more common if we don't act to offset the damage. No single person's sewer-connected drainspout can be blamed for this tragedy, but if each drainspout in the watershed was disconnected, maybe these deaths could have been avoided. Just a couple of weeks ago I had a blog post about how dry Vermont was. It's amazing how quickly things change. The dry conditions continued for a while after I made that post, but last week it started raining. The rain started with an overnight drenching on the night of the 9th, amounting to an inch of rain around the Middlebury River watershed. 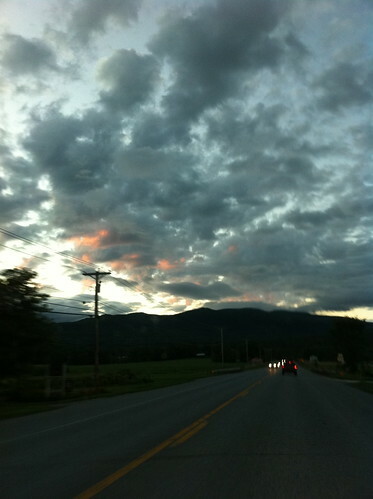 On the 11th much of Vermont was relatively dry, with only a few scattered thunderstorms. However, a slow-moving severe storm formed near Middlebury and moved right up the Middlebury River, through East Middlebury and Ripton. The storm dumped an additional 2 to 3 inches of rain in the watershed, in about an hour! I recently came across some photos of huge pots that are used in Thailand to collect rainwater from rooftops for use. These pictures were posted by John Hawker of Sat-Ed, a group that works to bring Internet access, and thus access to global information and education, to rural areas of Southeast Asia. It's hard to believe after the soakings of this spring, but Vermont is in the midst of a summer dry spell. This isn't an extreme drought of the sort that Texas is experiencing. It's quite normal for Vermont to have several weeks of mostly dry weather in midsummer. As is often the case, there have been at least a few thunderstorms in Vermont each afternoon, but they have been small and fast-moving. This dry spell isn't phasing the lush green growth in meadows and the forest understory that grew after this spring's rain. It is having an effect on the Middlebury River, though. 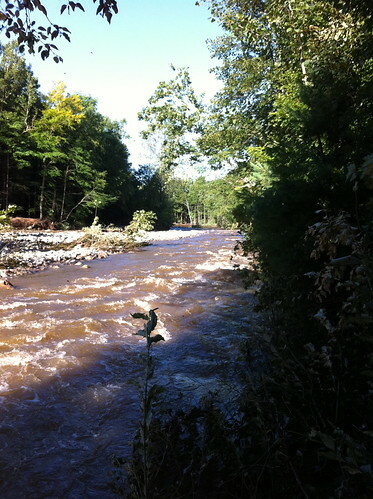 With a steep, relatively small watershed, the Middlebury River is very sensitive to weather events in the short term. In fact, it reminds me a bit of the washes and canyons in southern California, with one key difference: even during dry periods, the Middlebury River is always flowing. Most rivers and streams in southern California are dry this time of year, especially in areas with wide, cobbly or sandy riverbeds, like the part of the Middlebury River I most frequently visit. The view isn't from the exact same place, but note the leaning sycamore in both pictures. Note that this is also not the entire flow of the river, as this area has more than one river channel (typical of rivers that are full of cobbles and have a medium gradient). Even still, it really shows how the water level has changed. The picture also demonstrates how amazingly fast cottonwoods and sycamores grow. Those large saplings to the left are the same trees as the little seedlings in the first picture! When the land you are growing on washes away in floods every few years, you have to mature and set seed fast!